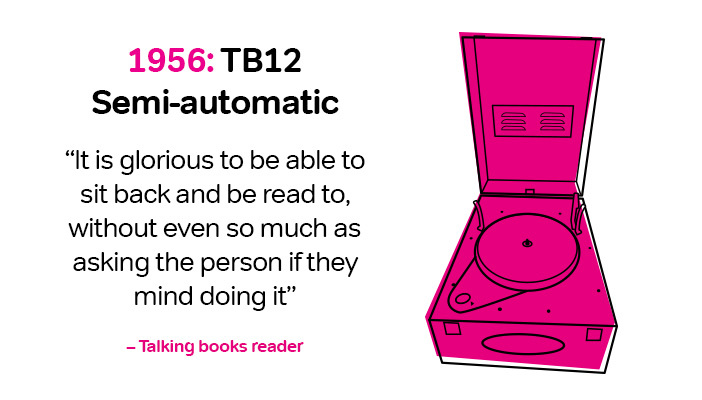 Making books talk is no easy feat, but RNIB’s efforts would be wasted without the proper machinery to play the resulting recordings. In the early years, talking book players were huge, mechanical things, loaded with up to eight gramophone records per novel. 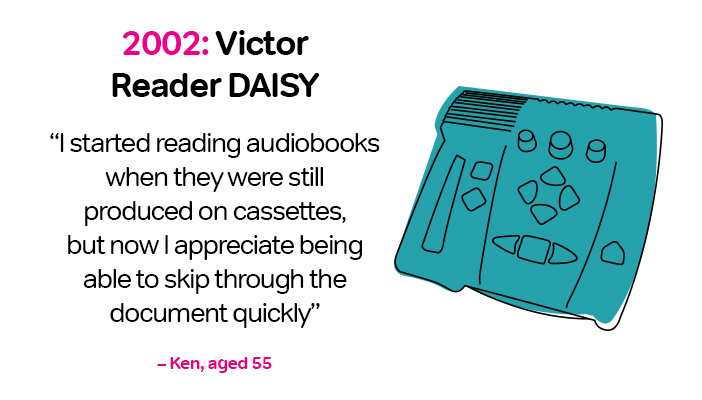 That seems archaic next to today’s compact DAISY players, but even those early inventions were years ahead of their time – and a lifeline for people who had experienced sight loss. 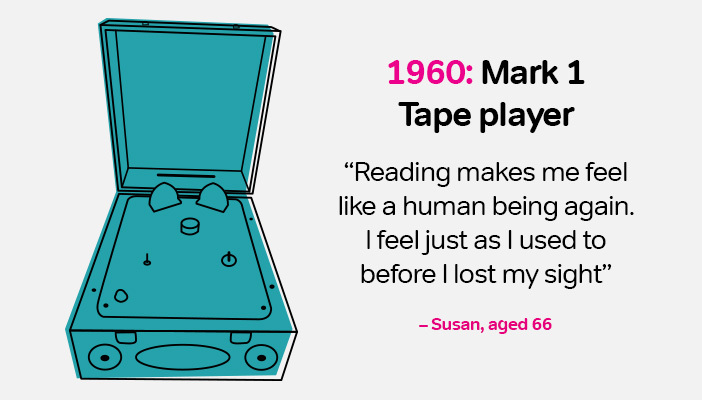 Machines have been instrumental in bringing books to blind people, while the evolution of our technology has long been at the forefront of audio innovation. 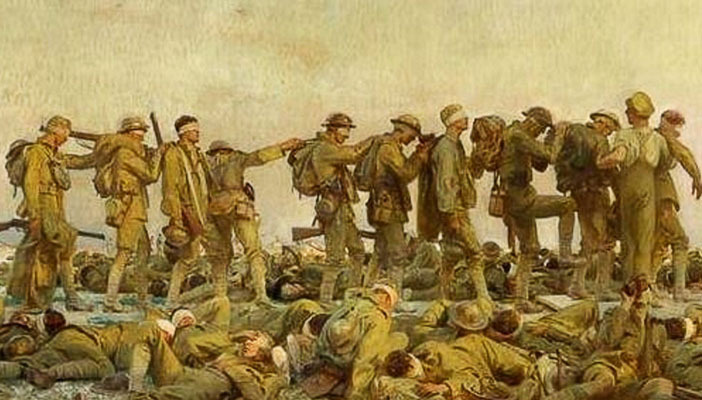 Read on to see just how far we’ve come. The first talking books were sent out alongside machines like this one on November 7, 1935. Popular music wouldn’t find its way onto records for more than a decade, but early talking books including Agatha Christie’s ‘The Murder of Roger Ackroyd’ were instantly popular with blind people. By 1937, there were already 1,000 machines in circulation. In 1947, following the end of the Second World War, these updated record players were being produced in significant numbers and brought with them a key new feature; mains power. The technology was groundbreaking, and – after consulting with RNIB – record companies Decca and EMI would use it to release their first LPs a year later. Record players were well established by the mid-1950s, but we weren’t done innovating yet. The TB12 Semi-Automatic featured a then cutting-edge mechanism that saw the needle automatically placed at the start of the LP when the lid was closed. Reading talking books was now easier than ever. Talking book LPs were great to listen to, but fragile and inflexible. 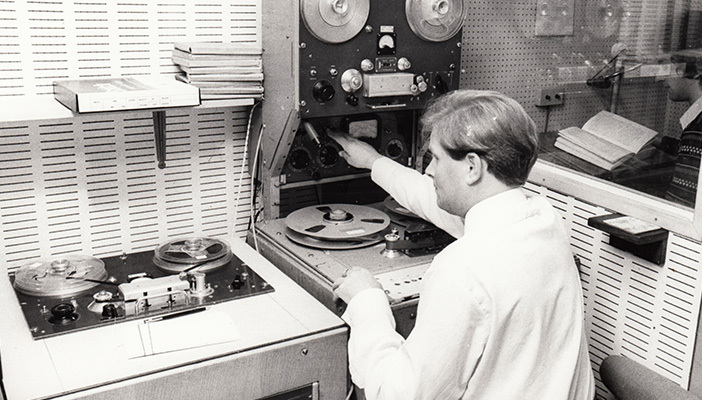 In the 1960s we moved to tape, a more adaptable format that would come to define our Talking Books service for more than four decades. Early tapes weren’t like the compact cassettes we’re used to now, though. They were so bulky the Post Office required a separate service to deliver them. 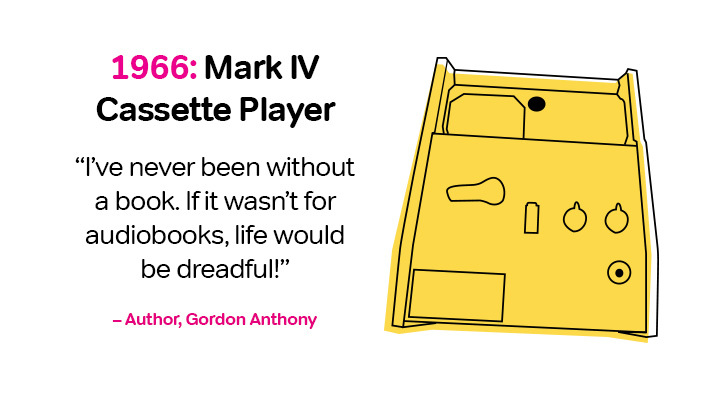 Thankfully, cassettes soon shrunk down, and by 1966 the Mark IV cassette player was launched which would transform our service forever. 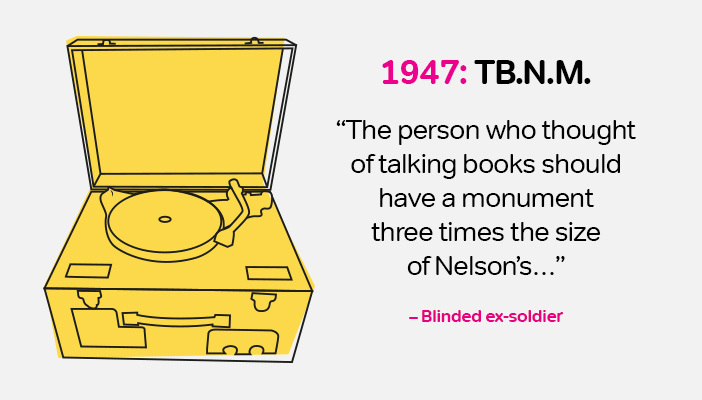 During this time our membership grew from under 10,000 members to well over 40,000, offering many blind people’s first experience of talking books. The magnificent Mark IV cassette player lasted a good 30 years, but by the mid-90s it was time for another change. Although much of the same technology remained in the TB2000, its design was given a much-needed update. Meanwhile, our library would boast 12,000 titles by the year 2000. New millennium, new technology – and our transition to digital may be the most significant step forwards since the original shellac players of the 1930s. DAISY – that’s Digital Accessible Information System – quickly established itself as the format of choice, offering enhanced navigability to give members the best reading experience yet. 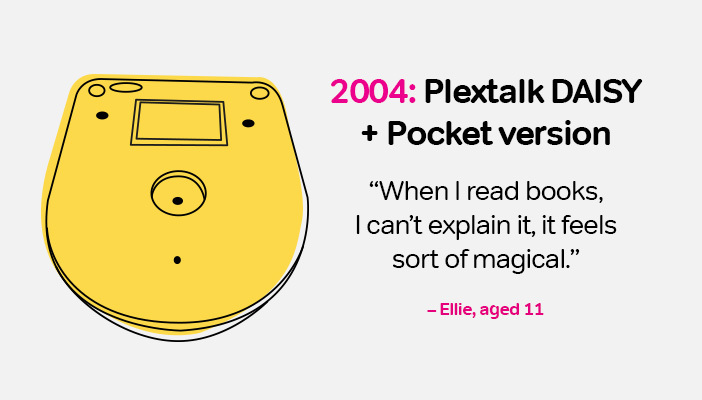 Just two years later, solid-state DAISY devices allowed ergonomics to come to the fore in design and accessibility, while devices like the Plextalk Pocket added portable options too. 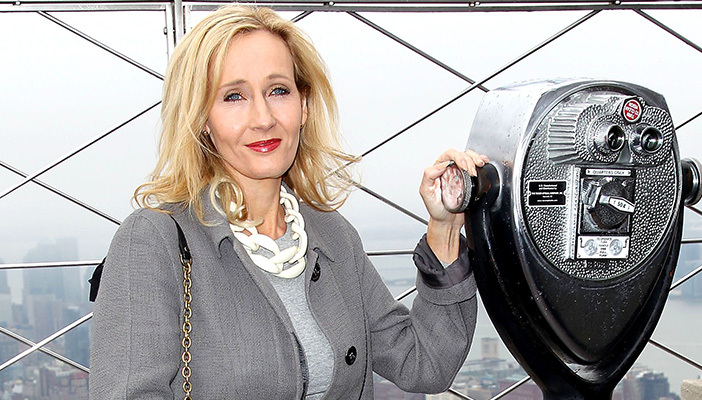 Now talking books are available on everything from smartphones to kindles, and RNIB’s recently launched Overdrive service means you can download your favorite books for your player of choice.